THE Galleons Passage will leave the port of Honolulu, Hawaii, on Monday bound for Acapulco, Mexico, on its journey to Trinidad. Tracking the boat yesterday using Marine Traffic Global Ship, the boat’s position was noted as having berthed at the port of Honolulu and online checks into Hawaii Port Call revealed the vessel had docked two days ago and would remain there for the next three days. When it leaves the port of Honolulu, the Galleons Passage will travel at 25 knots along the Pacific and is expected to take 12 days to reach Acapulco. But the vessel, bought by the TT Government from China to service the sea bridge, is expected to remain in Acapulco for five days. It will then make its way to Cuba where it will be outfitted with a deck and seats. It is expected that the job will take about ten days. The Galleons Passage will then set sail for Port of Spain, a journey which will see the boat eventually arriving by the middle of next month. 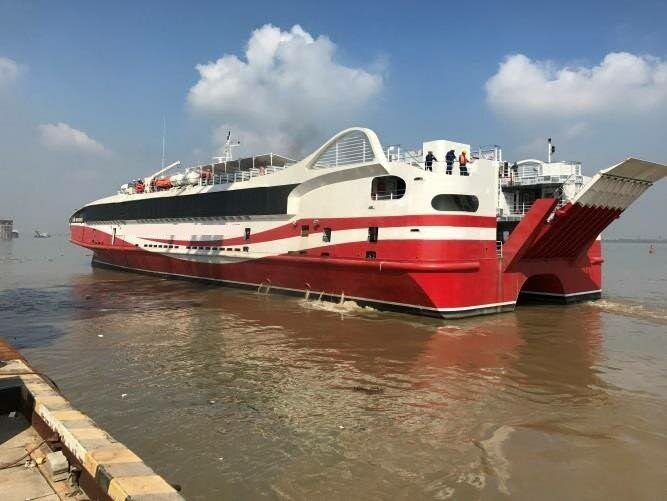 Last month, Finance Minister Colm Imbert gave April 27 as the tentative date for the boat’s arrival. Reply to "Galleons Passage leaves Honolulu Monday"